Be strong. And Aware. And find the balance of keeping my guard up while also remaining soft and kind. Try all the new foods. Do the things I can’t do at home — prioritize spending time & money on experiences not things. REFLECT REFLECT REFLECT — It is what slows things down and puts me where I am or else everything will just blur by faster than it already does. Listen to people. Get lost in listening to them. Don’t worry so much about the time. Ask them about their life here and what they love about their life! Pay attention to those around me who make me feel good, appreciate them, and focus on making them feel good too. Allow people to do nice things for me — then reciprocate! Look up the facebook events in my city so I can do many things! Find ways to pick myself up when I’m feelin down — music, movies, books, exercise, going outside, dancing, sunsets, climb trees, swim!! *** Be sure to sincerely thank those who have helped me to have these opportunities & those who have helped me feel welcomed. Then GIVE BACK to the community that has welcomed me! Remember what it felt like to be a guest so that when I go back home I can warmly welcome others and go out of my way to help them the way countless people have done for me here. Today was our 10th day in Switzerland and in 2 days we will fly back to Amman. So quickly, we switched from conscious showers and laundry days in the 3rd most water stressed country to being steps away from a huge lake where it also rains nearly every other day. We are so lucky to experience two extremely different cultures and landscapes it’s incredible. The only common thing we have experienced in both Amman and Switzerland has been the food. Our stomaches expanded for the frequency of eating in Amman and that did not have to change when we came here! I have never eaten so much ice cream, chocolate, and cheese in my entire life! It has been such a happy time here for all of us! We all immediately felt excited, safe, and comfortable right when we arrived. We are so lucky because we got to be here during the fall season which has been SO beautiful with so many colors! I’ve gone swimming twice and I got to rent a bike for 4 hours for free!! And I rode it to see the country side! Within the towns we have visited, everything seems so convenient and close — within each town we could walk anywhere we wanted to go. We first stayed in Geneva, then Nyon, and now we are in Montreux. I think we all loved Geneva the most. Everyone here is so beautiful and they all look so effortlessly cool!!! Most people ride their bikes, rollerblades, or scooters. Scooters have been SO common. We have gotten to visit the United Nations, the Red Cross and their museum, the OHCHR (Office of the United Nations High Commissioner for Human Rights), WHO (World Health Organization), UNHCR (United Nations High Commissioner for Refugees), Medecins Sans Frontieres (Doctors Without Borders). Wow writing that out reminds me how much we have gotten to do in just this short trip! So we had lectures from each of these organizations about what they do, their personal experiences, and challenges they have had. Everyone in our program wants to have some sort of career in humanitarian aid or international relations so this has been a dream to visit these places. It has been so inspiring and helpful to imagine all the different things we are capable of doing with our future! Tomorrow we are taking a train to Bern which is the capital and then we will go back to Jordan soon after that! 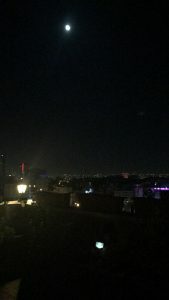 Although we all love it here so much I think it was the perfect amount of time and I am happy we are going back to Amman because we all already feel so comfortable here and at times it reminds us of home in some ways. I think the point of study abroad, or at least the program we chose, is to travel outside of our comfort zone and to experience and learn about things we are not so familiar with. It was so refreshing to be here but it is definitely time soon to go back and challenge ourselves again! We will be starting our independent study projects soon when we get back and I am really looking forward to it. My idea right now is to study and document the struggles of refugee women and girls with disabilities because there are no special services or resources for their needs. So I’m interested to document what they are going through and what would best nurture their mental and physical health. I will write more about it when I develop it further! Au revoir & Ma salamah!